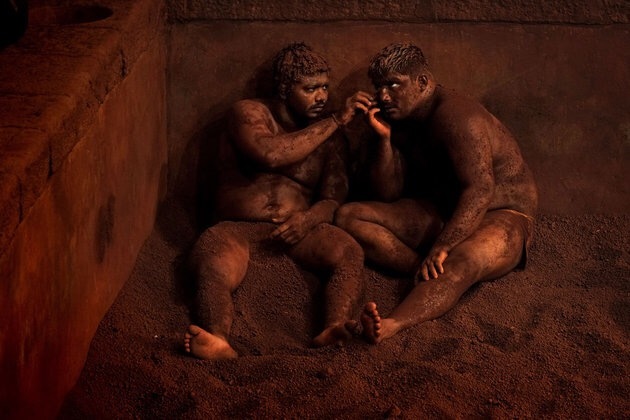 Another 55, rather a draft, for Kerry O’ Connor’s prompt on Real Toads to use a photo from the 2015 National Geographic contest; the above taken by Alain Schroeder in Maharashtra, India, of Kushti wrestlers. This entry was posted on January 3, 2016 at 9:38 pm and is filed under poetry, Uncategorized. You can subscribe via RSS 2.0 feed to this post's comments. Many forms of motivation for this type of competition (or any really), money, fame, athleticism…The picture and poem make a bold statement together. Wrestling is a very ancient form of our innate desire to compete and excel(and dominate as well, I’m sure) You capture a feel of that timelessness here, and of the commonality of our clay and bruises–I love the title working into the poem so perfectly, too. I feel like these guys (in the picture) may be forced into wrestling out of caste or money–and yet I’m sure all the innate stuff takes over too when they are actually wrestling. I like the way the title-feed worked too–of course, it started as a 55 gimmick! To get the word count right–but then I didn’t mind it–ha. (It is ten degrees here.) k.
Really powerful. The matter of fact tone mixed with the words packs such a punch. Yes! There is always a winner, but not always a fair one.